Apple may be notoriously secretive and tight lipped, but the company appears to be getting worse and worse at actually keeping things under wraps. The iPhone 5 appears to be the most leaked handset in existence. Thankfully, the suspense is over, the next-gen iPhone is finally here and it does, in fact, go by the numerical title of 5. Just like the parts that have been circulating on the web, this is a glass and aluminum two-tone affair and, at 7.6mm it's a full 18 percent thinner than the 4S (though, contrary to what Tim Cook said on stage, one slide has the iPhone 5 at 8mm even). It's even 20 percent lighter at 112 grams, which is even less than the mostly plastic Galaxy S III. It's all those "magical" things and it packs a larger 4-inch in-cell display. The new version of Apple's Retina panel is 1136 x 640, which clocks in at a more than respectable 326ppi. It also sports better color saturation with full sRGB rendering. That new longer screen allows for an extra set of icons to be displayed on the home screen, and first party apps have already been tweaked to take advantage of the additional real estate. The iWork suite, Garage Band and iMovie have all been updated. Older apps will still work too, though they'll be displayed in a letterbox format until an update is issued. The tweaked ratio puts the iPhone 5 display closer to 16:9, but it's not quite there. The most exciting news is likely the addition of LTE. There's still HSPA+, EV-DO, EDGE and all that jazz on board, but it's the true 4G that is really generating excitement. In the US Sprint, Verizon and AT&T will all be able to take advantage of the single chip (data and voice) LTE solution inside. And, if you're stuck on one of those tiered data plans, the 802.11 a/b/g/n antenna should help you keep your wireless usage in check. Notably missing however is NFC, which had been rumored to make its Apple debut with the iPhone 5, but is nowhere in sight. What that means for the burgeoning mobile payment industry (or for Apple's ability to keep pace with its competitors) remains to be seen. However, it does add EV-DO rev. B to the mix and keeps both GLONASS and GPS for navigating your way around the globe. If the brand new radios weren't enough of a raw spec update to get your geek blood pumping, the new A6 CPU inside should push you over the edge. Apple claims its a full two times faster than the chip inside the 4S, but we'll have to wait and see how accurate that assertion is. The A6 is reportedly 22 percent smaller than its predecessor, which probably helped Cupertino achieve such slim dimension on the iPhone 5 and it's also more energy efficient -- allowing the handset to chug along for 8 hours of talk time, despite the addition of LTE. Keeping your data usage to Wi-Fi will allow you to milk up to 10 hours out of the device. As for the camera, it's more or less the same as that in the iPhone 4S, just a little bit slimmer. It's a backside-illuminated 8 megapixel sensor with a 5 element lens and an f/2.4 aperture. The biggest improvement in the image capturing department is the "shutter" speed. Apple is claiming the new setup is 40 percent quicker at turning a beautiful sunset into a cold hard series of 1s and 0s. There's also a new panoramic shooting mode that stitches together an "effective" 28 megapixel photo. And, what camera update would be complete without the ability to capture 1080p video. The front facing cam has also received a mighty boost, getting its own backside-illuminated sensor capable of capturing 720p clips. Even better, that iSight cam can be paired up with FaceTime for high-res video chats over that fancy new 4G network you'll be surfing on. If you thought there wasn't anything else that could possibly be tweaked, you're wrong. Apple even gave the microphone an upgrade to a five-magnet transducer that should improve voice quality on networks that support it and enable Siri to better decipher your mumblings. And, as expected, the dock connector has gotten a long-overdue revamp. The eight-pin plug is 80 percent smaller and all digital -- it even has a catchy marketing name: Lightning. If you've got a bunch of accessories designed for the old connector, you're not completely left out in the cold. Apple will happily sell you an adapter, of course, provided that's a luxury you're willing to spend $29 on. Obviously, no new iPhone would be complete without a new version of iOS, and the 5 will be rocking iOS 6 right out of the box. The latest mobile system from Apple packs a boat load of exciting improvements, including tweaks to Siri and the new Passbook (which would have worked really well with that rumored, but ultimately non-existent NFC chip). When the iPhone 5 ships, you'll have your choice of two colors: black or white. The white has a raw aluminum back (not unlike the original iPhone) and the black sports a dark anodized body. As expected the iPhone 5 will start at $199 for the 16GB model, while the 32GB will cost $299 and the 64GB $399 -- so no changes there. Sadly, we're still waiting on a 128GB version. Shipments in the US, Canada, UK, Germany, France, Australia, Japan, Hong Kong and Singapore start on September 21st, but you'll be able to pre-order starting on the 14th. Apple plans to add 20 more markets in the coming month. You'll find the full PR below. SAN FRANCISCO--(BUSINESS WIRE)--Apple® today announced iPhone® 5, the thinnest and lightest iPhone ever, completely redesigned to feature a stunning new 4-inch Retina™ display; an Apple-designed A6 chip for blazing fast performance; and ultrafast wireless technology*-all while delivering even better battery life. ** iPhone 5 comes with iOS 6, the world's most advanced mobile operating system with over 200 new features including: the all new Maps app with Apple-designed cartography and turn-by-turn navigation; Facebook integration; Passbook® organization; and even more Siri® features and languages. "iPhone 5 is the most beautiful consumer device that we've ever created," said Philip Schiller, Apple's senior vice president of Worldwide Marketing. "We've packed an amazing amount of innovation and advanced technology into a thin and light, jewel-like device with a stunning 4-inch Retina display, blazing fast A6 chip, ultrafast wireless, even longer battery life; and we think customers are going to love it." The 8 megapixel iSight® camera is the most popular camera in the world and with iPhone 5, it's even better. The new camera is completely redesigned with incredible optical performance, yet amazingly it's 25 percent smaller than the camera in iPhone 4S. The new iSight camera in iPhone 5 features a sapphire crystal lens cover that is thinner and more durable than standard glass with the ability to provide crystal clear images. The new panorama feature lets you capture jaw-dropping panorama images of up to 28 megapixels by simply moving the camera across a scene in one smooth motion. New video features include improved stabilization, video face detection for up to 10 faces and the ability to take still photos as you record. A new FaceTime® HD front facing camera makes FaceTime calls incredibly clear and can also be used for self portraits and recording 720p HD video. 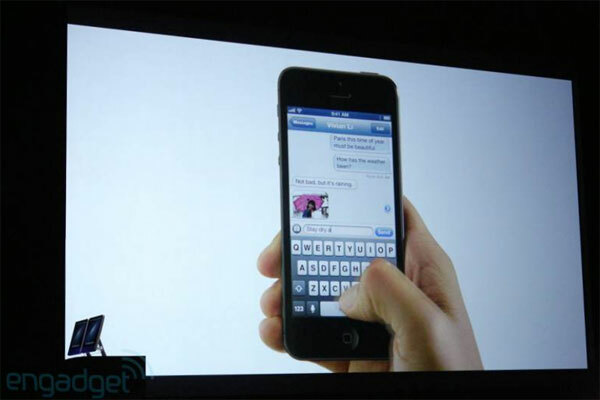 iPhone 5 also allows you to share photos with friends and family using iCloud's Shared Photo Streams. iPhone 5 comes with iOS 6, the world's most advanced mobile operating system with over 200 new user features including: an all new Maps app with Apple-designed cartography, turn-by-turn navigation and an amazing new Flyover™ view; Facebook integration for Contacts and Calendar, with the ability to post directly from Notification Center; Passbook, the simplest way to get all your passes in one place; new Siri features, including support for more languages, easy access to sports scores, restaurant recommendations and movie listings;***** Siri and Facebook-enabled apps like Photos, Safari® and Maps; and Shared Photo Streams via iCloud®. iPhone 5 comes in either white & silver or black & slate, and will be available in the US for a suggested retail price of $199 (US) for the 16GB model and $299 (US) for the 32GB model and $399 (US) for the 64GB model. iPhone 5 will be available from the Apple Online Store (www.apple.com), Apple's retail stores, and through AT&T, Sprint, Verizon Wireless and select Apple Authorized Resellers. iPhone 5 will be available in the US, Australia, Canada, France, Germany, Hong Kong, Japan, Singapore and the UK on Friday, September 21, and customers can pre-order their iPhone 5 beginning Friday, September 14. iPhone 4S will also be available for just $99 (US) and iPhone 4 will be available for free with a two-year contract. ****** iOS 6 software will be available on Wednesday, September 19 as a free software update.